This plan was revised in 2016. 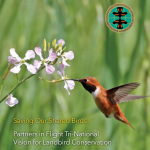 The plan documents the current widespread decline in landbird species throughout the U.S and Canada and presents prioritized related conservation objectives. 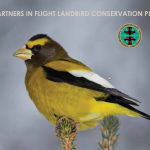 This document presents a comprehensive conservation assessment of landbirds in Canada, Mexico, and the continental United States. 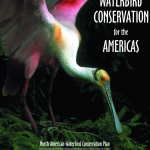 This tri-national vision highlights the vital links among North America’s migratory birds and the highly threatened resident species in Mexico. It points to a set of continent-scale actions necessary to maintain the landbird diversity and abundance that are our shared responsibility. 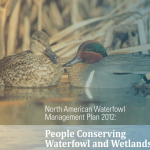 These documents affirm the vision of the North American Waterfowl Management Plan and of the U.S., Canada and Mexico to recover waterfowl populations by restoring and managing wetland ecosystems, to conserve biological diversity in the Western Hemisphere, to integrate wildlife conservation with sustainable economic development, and to promote conservation partnerships of public and private agencies, organizations and individuals. This initiative focuses on waterbirds across the continent. Primary attention is provided to species that are not currently addressed by other conservation initiatives, and includes grebes, rails, seabirds, terns, and herons. Partners from state and federal agencies, joint ventures, and non-governmental organizations from across the country pooled their resources and expertise to develop a conservation strategy for migratory shorebirds and the habitats upon which they depend. 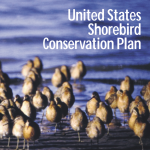 The U.S. Shorebird Conservation Plan provides a scientific framework to determine species, sites, and habitats that most urgently need conservation action. Main goals of the plan, completed in 2000, are to ensure that adequate quantity and quality of shorebird habitat is maintained at the local levels. These national assessments were used to step down goals and objectives into 11 regional conservation plans. Plan partners are working with joint ventures to accomplish these goals. The Shorebird Plan is administered by the Division of Migratory Bird Management.